Good things come in threes we're told, and to prove it, here are three emerging bands with excellent new EPs just out. They are Birds vs Planes from Carlisle, Silver Shields from North London and old favourites Mahogany Hand Glider from Leeds. First out of the blocks are Birds Vs Planes whose 'Narrow Angles' debut EP launched on March 21st. They are almost "veteran" newcomers and have already put in a fair few miles on the road supporting the likes of Glasvegas and Mystery Jets to name just two. This is an exceptionally likeable 5 track EP without pretension – opener and single 'Relative Worth' kicks it off in fine style. It has to be said that female fronted alt/indie bands are quite numerous and making an impression must be tough – which may explain why it’s taken the band a while to get signed and released. But they know their stuff and I firmly predict persistence will pay off in the end. Listen to: 'Relative Worth', 'Little Blue'. Next come Silver Shields from North London whose self-titled debut EP came out on April 21st. Now I must declare that they have said they may write a song about me should I review their EP, and I have to say that same innovative approach is evident in their music as well. They too feature female vocals and style themselves as ‘neo-psychedelic’. 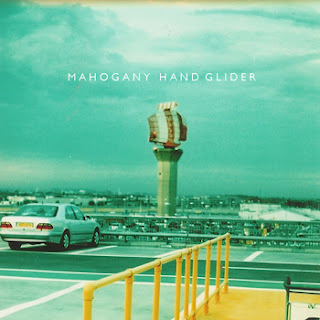 Finally, Mahogany Hand Glider release EP number two on April 29th. 'Bless The Fat' features three tracks of math-rock instrumentals and shows a healthy progression from the first EP, which we also liked a lot. A brave signing for a new label – Destroy All Records – they have moved on significantly even since late last year. The songs have a stronger narrative and a lighter touch. It’s a tough genre and I really respect the way they’ve sharpened up their sound – evident from the off on opener 'Well Perched'. The CD comes ‘equipped with an exclusive inter-stellar pictorial poster of terrestrial and extraterrestrial endeavours’. There’s even some outer space related spoken word on the closing track 'Baulsa Erupt' - so what are you waiting for? I so hope this band succeeds. For your chance to feature in a future Simon Says column, email Simon at altrock(at)fadedglamour.co.uk.